SmartWhois is a useful network information utility that allows you to find out all available information about an IP address, host name, or domain, including country, state or province, city, name of the network provider, administrator and technical support contact information. SmartWhois can be configured to work from behind a firewall by using HTTP/HTTPS proxy servers. Different SOCKS versions are also supported. Unlike standard Whois utilities, SmartWhois can find the information about a computer located in any part of the world, intelligently querying the right database and delivering all the related records within a few seconds. The program can retrieve information from more than 100 servers all over the world. SmartWhois can save obtained information to an archive file. Users can load this archive the next time the program is launched and add more information to it. 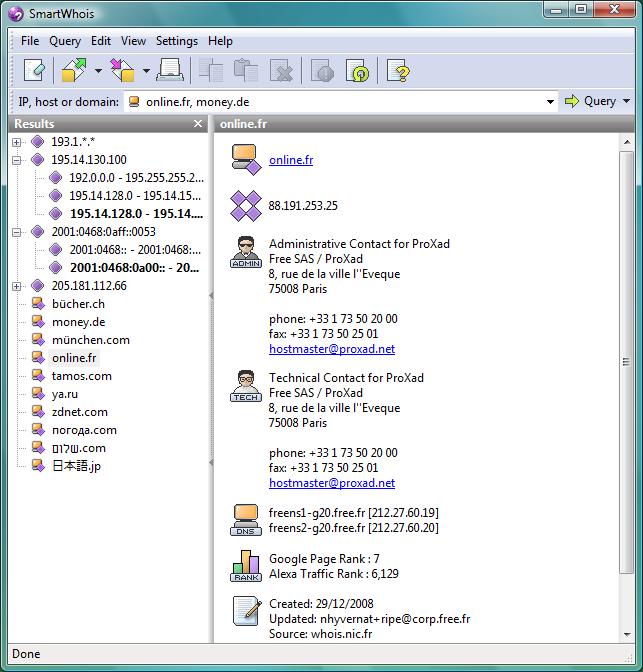 This feature allows you to build and maintain your own database of IP addresses and host names. The obtained records may also be saved in one of the several formats: HTML, text, XML, and XLS. Another useful feature in SmartWhois is the ability to load a list of IP addresses as a text file and processing it. SmartWhois is capable of caching query results, which reduces the time needed to query an address; if the information is in the cache file it is immediately displayed and no connections to the whois servers are required. Website promotional tool, which automates the process of registering your website with engines and directories. It can dramatically increase the number of visitors to your website. Version 8 can fill in most submission pages from manual directories. Search Engine Optimization application that features all the SEO tools you will ever need to manage your web site and reach the top of the search engines. New tools in version 3: competitors analysis, pre-filling of directories submission forms. Advanced Port Scanner is a small, fast and easy-to-use Port Scanner for Windows. It is multithreaded, so you can scan ports in just a few seconds. Also, it contains descriptions for common ports, and can perform scans on predefined port ranges. This site does not contain serial number, crack, keygen SmartWhois serial number : serial number is the simplest type of crack. A serial number(cdkey,product key,etc) is register the program as you may already know. a crack or keygen may contain harmful software. If you cannot find the exact version you want, just give it a try. for more information read .nfo/.txt/.diz file include in zipped file.